Watching certain movies reminds us why we should read more books. Pop quiz, hotshot: what 2018 film, the tenth in its series, not only has a bevy of references to Charles Dickens’ The Christmas Carol and A Tale of Two Cities, Terry Gilliams’ masterpiece Brazil (your humble correspondent’s favorite movie), and Star Wars, but also contains a scene in which a dog bursts out of a person? If you answered Tyler Perry’s Boo2: A Madea Halloween, you’d be close, but in fact the answer is Hellraiser: Judgement, the latest (and, sadly, probably not the last) in a series of horror films that’s been running for some 30 years. The plot of the films, insofar as they are films, involves a puzzle box that, when opened, unleashes a bunch of demonic creatures with sadomasochistic tendencies called Cenobites. Their leader, affectionately known as “Pinhead” by fans because he resembles nothing so much as Uncle Fester combined with a hedgehog, is given to purring nonsensical prattle about “pleasure and pain” how he “has so many wonderful things to show you” in a thick British accent. 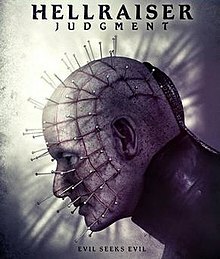 As written (and directed) by Clive Barker, the first Hellraiser film was a (marginally) more intellectual approach to the splattering of grue than, say, Friday the 13th or Nightmare on Elm Street, and its themes involving the dark side of sexuality dovetailed nicely with a decade in the grips of an AIDS panic, albeit in a slightly trashy way. Even so: if I haven’t made myself clear, I love the first movie. Matter of fact I like the second, too, with its hallucinatory trip into Hell itself, which it turns out looks a whole lot like an abandoned hospital designed by MC Escher. But with the third film the franchise began a prolonged, 20-some year long belly flop. As a reluctant fan of the series, I’d like to say that Hellraiser: Judgement represents a return to form, but sadly that’s not the case. Above all, the movie’s defining trait is laziness: the story, such as it is, concerns a trio of detectives trying to solve the case of a mysterious, religiously-motivated serial killer (Se7en, anyone?) the identity of which, naturally, is the subject of a spectacularly lazy plot twist: in a film with four characters (three cops and a demon) there just aren’t enough options for a whodunit to be interesting. In fact, it’s all more than a little boring. And for a movie in which a demon types with blood on a skin parchment, boredom is a cardinal sin. The verdict: avoid unless you, like the Cenobites, are supermasochists.